Tired of blustering atheists and triumphalist Christians? Here's an alternative. Greg Graffin is a punk rocker whose "lyrics often concern themselves with religion." 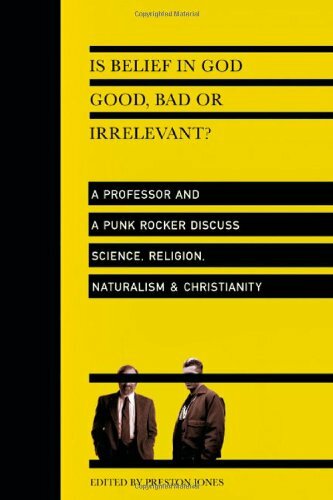 As front man, singer, and songwriter for the band Bad Religion, he's an ardent atheist who also happens to hold a Ph.D. in zoology from Cornell University. Preston Jones is a history professor at John Brown University with a penchant for punk rock. A fan of Graffin's band, Jones is a "Christian with a deep commitment to God that somehow coexists with a skeptical disposition toward much of what I hear people say about God." Is Belief in God Good, Bad, or Irrelevant?, is Jones and Graffin's spirited repartee on matters majestic and mundane, set in motion by Jones' "whim" to send Graffin an appreciative email. Longtime Books & Culture readers may recall Jones' essay "The Punk Rocker with a Ph.D." from the March/April 2004 issue. Here is the fruition of that piece. Jones introduces the exchange with a caveat. This tete a tete was not originally intended for "public consumption" but is lightly edited following the decision to publish: "I'm making this correspondence available because I hope it will promote thought and conversation … a starting point for people interested in putting their intellects to work … (and) encourage people to use the brains God gave them." The book neither cites exhaustively nor covers its controversies comprehensively: "We think it's worthwhile for people to see what an uncanned, unorchestrated conversation between people of very different beliefs can look like." So what do Jones and Graffin hash out? Evolutionary biology, religion in education, foundations for morality, free will vs. determinism, brutality in the name of and under the auspices of religion and secularism, implications of worldview in approaching injustice, theodicy, afterlife, the pursuit of happiness, sating the thirst for beauty and truth, smugness and self–righteousness, correlation between truth and pragmatism, intuition, Evelyn Waugh's Brideshead Revisited, and more. Peppering the dialogue are insights from music, art, literature, philosophy, and religion. Cameos from sources ancient and recent incorporate Augustine and Bertrand Russell with Stephen J. Gould, Christopher Hitchens, and Richard Dawkins (preceding the publication of Dawkins' The God Delusion and Hitchens' God is not Great). Tidbits from Pope John Paul II, Pascal, and John Polkinghorne season the cerebral stew. A spin–off conversation between Jones and one of Graffin's students introduces a female voice. Endnotes and a short study guide offer research and discussion questions for each chapter. Jones and Graffin's dialogue lacks resolution compared with Letters from a Skeptic (1994), a similar exchange between son and father Gregory A. and Edward K. Boyd. After nearly three years of letter writing with his Christian son, the elder Boyd (Edward) forsook atheism and embraced faith in Jesus. In contrast, neither Jones nor Graffin yields by book's end. Continued interaction is implied. Even though their tone is cordial, Jones and Graffin are not afraid to face contention point–blank or employ sarcasm and scathing criticism to opposing convictions. "Speak what we feel, not what we ought to say" (King Lear, 5.3.323) could serve as their motto. Poignancy and casual chatter interlace the interchange, humanizing what could have degenerated into high–pressure rhetoric. Graffin and Jones display edgy goodwill without breaking rapport, reminiscent of the punk rock that serves as soundtrack to their lives and ruminations. Musing on the serendipity permitting both parties to invest in such a conversation amidst hectic schedules, Graffin concludes playfully, "Where did we find the time? You know the answer, my friend: The Lord works in mysterious ways!" Atheists may chuckle at the thought of Christians who will read his words literally, while Christians will smile at the hint that God is wooing Graffin and that Graffin, however tentatively in jest, acknowledges the pursuit. Benjamin B. DeVan teaches at North Carolina Central University in Durham, North Carolina and at Peace College in Raleigh.